Thanks to your many feedback inputs, we have updated a few things to enhance the way you learn Mandarin Chinese on Ninchanese. This update focused most on the grammar stages, and we also made a few other changes to make your experience less confusing and more fun! The sentence ordering stages were initially a little too focused on experimentation, so we changed that. Yocha was keen on getting you to try and try again until you got the Chinese sentence right, so that you would *feel* how the sentence worked in Chinese. But it turns out that was quite hard and some people got stuck. Being stuck is not something we want – nor does Yocha, even if he likes challenging you from time to time! So we’ve updated those stages so they work the same way you learn Chinese vocabulary. Now, when you don’t get the sentence order right, we give you a chance to try it again later and show you the correct answer. That gives you time to see the sentence’s structure in Chinese! You’re then given another sentence to answer. It’s interesting to compare that sentence with the previous one, pick out the pattern, understand the logic and try to apply it! Then the sentence you got wrong before comes back and you can try your hand at it again. In this way, you really work on understanding how to make a sentence and integrate the logic of that Chinese grammar point. 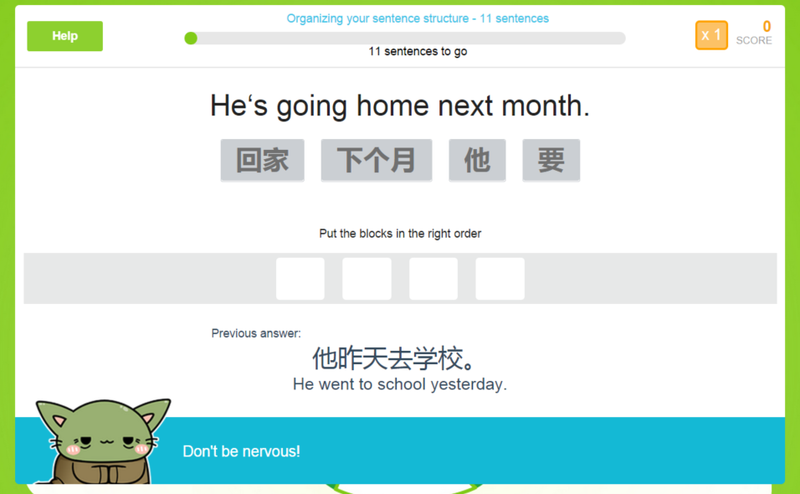 We’ve also added a little “help” button in each stage that sends you directly to the corresponding grammar lesson. That way, if you feel lost, you can read the lesson. We clearly believe that to memorize something, you have to experiment with it, actively work with it and so on to remember it, but sometimes, reading the lesson first is really the best way to understand the whole thing. Last thing about the grammar section, Yocha now gives you better comments to help you succeed even more! We also reworked the leaderboard – it had a few glitches here and there – and we now send you daily emails to help you come back everyday on Ninchanese. Because, if you really want to learn Chinese, we recommend you come learn a little something in Chinese every day. The best way to remember what you learn is to regularly do your vocabulary reviews, try to get 100% goood on each stage, and to unlock at least one stage per day. Short 20 minutes sessions are enough, you’ll see. So, each day, you’ll get a sweet little email from us, telling you about what you need to do, how your friends are doing in the app, the reviews that are waiting for you and the challenges you have to play. Isn’t that nice? We’re working on also bringing you a daily traning program so you know which steps to take each day on Ninchanese to master Chinese! We have also added a new illustration for the first world and we hope you like it! You’ll also be discovering the illustrations for the 5 next worlds in 2015, so that is very soon ;)! In addition, we cleaned up some links that went nowhere and hid some pages that were not quite finished yet so the experience on Ninchanese is less confusing. Scoring in some stages was also fixed, especially in the reviews: you can now really earn points for your longest chain! We know that bugged some of you. Lastly, and because you really deserve it: you can now win the “beta user”badge! Just log out and log in again to Ninchanese and you’ll get it. So there you have it, the first major updates in the Ninchanese beta! We hope you like what we’ve done! You’ve given us a lot of great feedback, which we are working to implement as fast as possible. We also still have a lot of ideas to implement and we hope to bring you all that soon. Remember, we’re just a little team of three Ninchas, but we’re all working as hard as we can 🙂 So keep an eye out, more fun features are yet to come! Again, thank you all for your help. We love hearing from you and consider you all part of the NinchaTeam! We wish you a happy end of the year!